Developing cost-effective, sustainable sources of electricity is one of the major challenges facing society. While immense progress has been made in solar and wind power generation, there remain many challenges to wide-scale deployment of these technologies. In particular, both solar and wind power are extremely intermittent, leading to the use for inefficient quick-response fossil fuel power plants to provide electricity when solar and wind installations cannot generate enough power. One option for replacing these supplemental fossil fuel plants would be to harvest excess energy from solar and wind farms when it is available, store it, and then release it to the power grid when the solar and wind farms are not producing energy. There are many potential ways to store energy generated by solar and wind farms, but our group focuses on the method used by nature to store energy, photosynthesis. In natural photosynthesis, plants convert sunlight into chemical energy by removing electrons from water to form oxygen gas and a proton gradient. These electrons are then transferred through the plant to react with carbon dioxide and form carbohydrates. In artificial photosynthesis, sunlight is converted into chemical energy by removing electrons from water to form protons and oxygen gas. Unlike in natural photosynthesis, these electrons are not used to make carbohydrates, but rather an efficient burning fuel, such as hydrogen gas. Efficient and effective separation of the electrons from the oxygen gas and produced is critical to converting sunlight into fuel. If these electrons are not separated from the oxygen gas, they will readily recombine to re-form water and release heat. 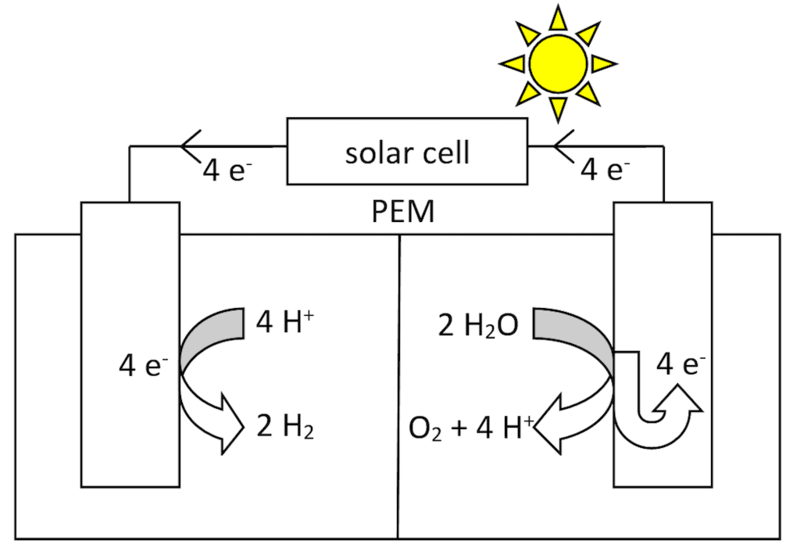 In typical artificial photosynthetic systems, the removal of the electrons from water (water oxidation) is performed in a separate chamber from the production of fuel (proton reduction), with the two reaction chambers linked by a proton exchange membrane (PEM) or frit. While this design has the advantage of allowing the fuel produced to be collected without separation, the systems are expensive and heavy which limits their use to fixed locations. Our group is investigating methods of achieving this separation of electrons without requiring the use of two reaction chambers, thus enabling portable and low-cost solar energy storage.